Remember that you’ll need to use the new email address to login in the future. You will receive a confirmation email to the new email address entered. Log in and click the My Account link at the top of the screen. The My Account page will open. 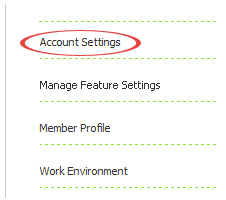 Click Account Settings on the left side of the page. Click the Edit button to the right of your Email Address. Enter your new email address in both email address fields, then click Submit.